I’m a subscriber that would like to be entered. I’m a subscriber and I would be thrilled to win this camera! My SLR camera(not digital)broke a few months ago and I have been wanting to replace it with a digital version. Thanks! Nice time for a new camera. I would love to enter. Already subscribed. I would like to be entered in this contest. I am a subscriber also. Since I broke mine at Disneyland getting off a ride, I NEED a new camera! Thanks for the chance. Be a nice X-Mas if this were mine. Thanks for the chance to win, and good luck to everyone! As a subscriber, I would like to be entered in this contest. What photo enthusiast wouldn’t enjoy this? I subscribe: Thanks for the contest. would love a DSLR. already a subscriber! I’m a subscriber. Thanks for the chance to win! I would like to be entered in this contest…there is no prize as awesome as this!!! 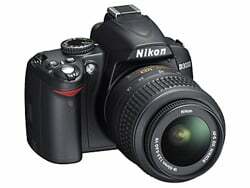 Nikon manfactures the best cameras! The camera looks like a great prize! This camera kicks but! I hope I win this! I’m a subscriber ~ Thanks! Wow! What a GREAT camera, would love to win this beauty! This would be a great win for me. I need a camera. This one would be perfect for me. Thanks for the great camera contest! I would also like to be in the contest. That Nikon is a sweet camera!